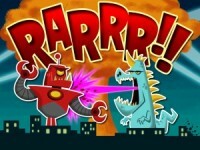 BoardGaming.com> Games> Card Games> RARRR!! RARRR!! is APE's card game of earth-shaking battles between giant Japanese movie monsters (daikaiju). Each player creates a monster, builds up its power, and then battles against other monsters to destroy the world’s greatest cities. Monsters are constructed using Katakana cards, which create the monsters' names and give them terrifying powers. Players spend their monsters' power when battling other monsters. The winner ravages the city. But be careful how you spend your power - there are a lot of cities to crush! Add a Review for "RARRR!!"